Work is the price you pay for money. This topic relates to all types of power amplifiers, and talks about power ratings and volume levels. Speaker systems are usually shown with an absolute measure, like "98dB @ 1 Watt, 1 metre". This is not as complicated as it looks; it means that the speaker produces a sound pressure level (SPL) of 98dB when measured 1 metre away using a 1 watt signal. This is a reasonably accurate way to compare speaker systems. When comparing speakers, or power amplifiers, it is the relative measure that is important. These are highly subjective, meaning that different people will hear this different ways, and "twice as loud" is a much harder thing to guess than something like "twice as high"! Also, guitarists will usually use extra power to drive extra speakers for a wider spread of sound, resulting in a perceived volume increase more than that produced by the additional power alone. Lead vocals, and solos should be a few dB louder than the combined level of the rest of the band to be clearly audible above the band. This will not normally be a problem when playing with good musicians, who will also adjust their own levels to make sure your solos can be heard. They should also play with complementary tones and rhythms that do not compete with what you're playing. 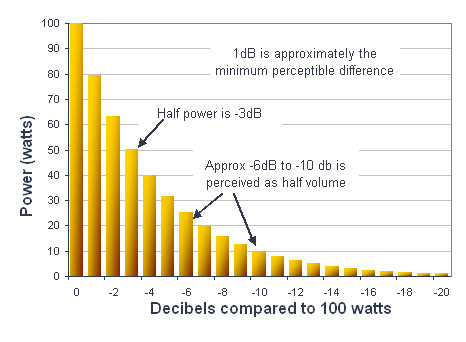 OK, now we know about decibels, and that 1dB is roughly the smallest change we can perceive. Have you ever wondered why a 100 Watt amp doesn't sound twice as load as a 50 Watt amp? It's because double the power is equivalent to only a 3dB increase in volume! This is the same for any power comparison: provided you use the same speakers, and the same amp design (more on that later). 60 watts is 3dB louder than 30 watts, 400 watts is 3dB louder than 200 watts, etc. Likewise, double the volume requires at least a 6dB increase, which is equivalent to 4 times the power! Bear in mind though, that there are often other factors that make a difference. Playing in a band with an amplifier that is slightly underpowered for the rest of the band is nearly like playing without an amplifier at all. So playing with an amplifier that may be only 3dB louder (double the power) may be just enough to be heard properly, and make all the difference. Also, when playing at low volume levels, your ears hear middle frequencies more efficiently (so you would need to turn up the bass and treble a little to keep the same tone). This in itself makes it hard to compare drastically different power levels. This is also why speaker efficiency is so important. If one speaker is 3dB less efficient that another (so that's -3dB), it is effectively like using an amplifier with only half the power. Of course, -3dB is "noticably quieter", but not half the volume level. 30 watts is common for quiet to medium volume rehearsals, recording, and bands that consciously perform at medium levels to allow a full sound mix by an engineer. Fortunately, most professional guitar amplifiers are rated in Watts RMS, which allows for a reasonably fair comparison between amplifiers of the same general design. Chances are you've also seen 'ghetto blaster' sound systems in electrical outlets advertised with power ratings like 2000 watts in a plastic case the size of a lunch box! So what gives? While its not false advertising, it is somewhat misleading by using a measure that is not necessarily typical for all types of music played on the system. But for what it's worth, RMS power is not necessarily representative of the perceived loudness of a guitar amplifier (see below). Maths alert - arithmetic lies ahead in the next few paragraphs! There are several different ways to measure power, but firstly, power is a simple electrical calculation. It is voltage multiplied by current (so a 12 volt battery driving a headlight that draws 10 amps of current = 120 watts). From Ohm's law, it is the same thing as voltage squared (multiplied by itself) then divided by resistance. So a 10 volt battery driving a 5 ohm load is 10 x 10 / 5 = 20 watts. For our audio guitar signals, though, we're dealing with alternating current (AC) as opposed to DC in batteries. All this means is that the signals fluctuate between a positive and negative value many times per second. Whether a signal is positive or negative at any given time does not matter for power calculations. This is also apparent in the calculation above where voltage is squared: (-10)x(-10)=100 is the same as 10x10=100. RMS (root mean squared) power is a statistical averaging method of the power delivered by a sine wave at some arbitrary low THD (total harmonic distortion) level. "Low distortion" usually means "at the onset of audible clipping". For a sine wave, the voltage is the sine wave's peak voltage divided by the square root of 2 (approx 1.4), and the resistance is the speaker impedance. So an amplifier that gives 14 volts peak (that's 28 volts peak to peak for the positive and negative halves of the sine wave) into an 8 ohm speaker gives a power of: 14 / 1.4 = 10 volts, 10 x 10 = 100, 100 / 8 ohms = 12.5 watts RMS. PMPO (Peak Music Power Output). There's no technical definition I can find for this, but it appears to be marketing speak for: "Let's find any excuse we can to advertise more watts"! So we use the peak power rating mentioned above (a fictional double of the RMS power), usually a stereo system, so double again, then sprinkle the fairy dust. There are suggestions that because some music played on these systems is highly percussive (such as techno), that the system can deliver much more power to handle these peaks for very short times. This multiplies the figure yet again by some arbitrary figure, but more importantly, it's very relevant to guitar amplifiers. I sincerely hope I never see a PMPO rating on a guitar amp, but we all know that a valve amplifier is noticeably louder than the same power solid state amplifier. How can this be? Using the calculations above, there is perhaps a 3dB difference, which would mean about double the power! Of course this is not the case, but there are reasons for the perceived difference. Most guitar playing is percussive in nature - there is a strong but brief burst of volume as you strike the string, then the note gradually decays to a lower level. Valve amplifiers exhibit a smooth transition into and out of overdrive, so for example, a 100 watt amp sounds only a little more distorted when trying to deliver 110 watts. This means that you can drive the amp quite hard with a "musically pleasant" amount of overdrive, that sustains a volume level at the amplifier's maximum power capability. As the note decays, the volume level changes little while the sound gradually cleans up (sometimes referred to as a "warm bloom"). On the other hand, solid state amplifiers are very clean right up to their maximum power output, then virtually switch to very high distortion levels above this point. This is hopeless when trying to play percussive sounds around the maximum power output, because the start of the note (the attack) is very distorted and unmusical, then it suddenly becomes clean as the volume dies (perceived as a lack of sustain). The only way to get a reasonable tone is to turn down and try to operate the amp always below its maximum power capability. Of course, many solid state guitar amplifiers now try to minimise this effect (also so they can be advertised with valve-like qualities). The combination of these two effects is what causes the difference in perceived volume between solid state and valve designs. But in reality 100 watts is 100 watts, whether its valve, solid state or steam driven!